جمشیدی, امین, نیکودل, محمدرضا, خامه چیان, ماشااله. (1396). معرفی پارامتر فیزیکو-مکانیکی برای برآورد دوام سنگ‌های تراورتن ‌ در برابر هوازدگی نمک. نشریه انجمن زمین شناسی مهندسی ایران, 10(شماره 3 و 4), 55-68. امین جمشیدی; محمدرضا نیکودل; ماشااله خامه چیان. "معرفی پارامتر فیزیکو-مکانیکی برای برآورد دوام سنگ‌های تراورتن ‌ در برابر هوازدگی نمک". نشریه انجمن زمین شناسی مهندسی ایران, 10, شماره 3 و 4, 1396, 55-68. جمشیدی, امین, نیکودل, محمدرضا, خامه چیان, ماشااله. (1396). 'معرفی پارامتر فیزیکو-مکانیکی برای برآورد دوام سنگ‌های تراورتن ‌ در برابر هوازدگی نمک', نشریه انجمن زمین شناسی مهندسی ایران, 10(شماره 3 و 4), pp. 55-68. جمشیدی, امین, نیکودل, محمدرضا, خامه چیان, ماشااله. معرفی پارامتر فیزیکو-مکانیکی برای برآورد دوام سنگ‌های تراورتن ‌ در برابر هوازدگی نمک. نشریه انجمن زمین شناسی مهندسی ایران, 1396; 10(شماره 3 و 4): 55-68. دوام سنگ­ها در برابر عوامل مخرب محیطی از مهمترین موضوعات مرتبط با انتخاب سنگ برای استفاده در سازه­های مهندسی به ویژه سنگ نمای ساختمان­ها می­باشد. تبلور نمک­های محلول یکی از مهمترین عوامل هوازدگی در طبیعت است که می­تواند بر خصوصیات مکانیکی سنگ (مانند مقاومت فشاری تک محوری و مقاومت کششی برزیلین) تاثیر بگذارد و در طول زمان باعث زوال­پذیری و کاهش دوام آن شود. در این پژوهش پارامتر فیزیکو-مکانیکی معرفی شده است که می­تواند خصوصییات مکانیکی سنگ­ها و در نتیجه دوام آن­ها را در برابر هوازدگی نمک با دقت و صحت مناسب برآورد کند. به منظور رسیدن به اهداف پژوهش، 15 نمونه تراورتن از معادن مختلف ایران انتخاب شد. از تراورتن­ها نمونه­ها و مغزه­های لازم برای تعیین خصوصیات فیزیکی (جذب آب، میانگین قطر حفره­های نمونه­ها) و خصوصیات مکانیکی (مقاومت فشاری تک محوری و کششی برزیلین) تهیه و مقادیر این خصوصیات تعیین شد. سپس مقادیر پارامتر فیزیکو-مکانیکی که بر اساس ترکیبی از جذب آب، میانگین قطر حفره­ها و خصوصیات مکانیکی می­باشد، محاسبه شد. با انجام آنالیزهای رگرسیون دو متغیره، رابطه بین مقادیر پارامتر فیزیکو-مکانیکی با مقادیر مقاومت فشاری تک محوری و کششی برزیلین بعد از آزمایش هوازدگی نمک بررسی و مناسبترین روابط برای برآورد دوام نمونه­های مورد مطالعه با استفاده از پارامتر فیزیکو-مکانیکی در برابر هوازدگی نمک ارائه شده است. نتایج نشان دهنده دقت و صحت مناسب پارامتر فیزیکو-مکانیکی برای برآورد دوام نمونه­های مورد مطالعه می­باشد. در نهایت با استفاده از پارامتر فیزیکو-مکانیکی معرفی شده در پژوهش حاضر، می­توان از انجام آزمایش زمانبر و پرهزینه هوازدگی نمک صرفنظر کرد. The durability of stone against environmental degradation factors is one of the most important issues related to stone selection for use in engineering structures, in particular stone stones. The crystallization of soluble salts is one of the most important weathering factors in nature, which can affect the mechanical properties of rock (such as uniaxial compressive strength and Brazilian tensile strength) and, over time, can decay and reduce its durability. In this research, a physico-mechanical parameter has been introduced that can assess the mechanical properties of rocks and thus their durability against salt weathering with accurate accuracy. To achieve the research objectives, 15 travertine samples were selected from different mines in Iran. Travertine samples were prepared to determine the physical properties (water absorption, mean pore diameter) and mechanical properties (uniaxial compressive strength and Brazilian tensile strength). Then, the physico-mechanical parameter was calculated, based on the combination of water absorption, mean diameter of the pores and mechanical properties. By performing bivariate regression analysis, the relationship between physico-mechanical parameter with uniaxial compressive strength and Brazilian tensile strength after the salt weather test was investigated and the most suitable relationships for estimating the durability of the samples using a physico-mechanical parameter against weathering is presented. The results show the correct accuracy of the physico-mechanical parameter for estimating the durability of the studied samples. As a result, the Physico-Mechanical Parameter avoids performing a salt crystallization test, which is time-consuming and expensive. حبیب­پور، ک.، صفری، ر.، 1388. راهنمای جامع کاربرد SPSS در تحقیقات پیمایشی (تحلیل داده­های کمی) “،چاپ دوم ، انتشارات لویهف متفکران، 861 صفحه. مهدوی، م.، طاهرخانی، م.، 1383.کاربرد آمار در جغرافیا. چاپ اول، ، نشر قومس، تهران،420 صفحه. Angeli, M., Bigas, J.P., Benavente, D., Menendez, B., Hebert, R., David, C., 2007. Salt crystallization in pores: quantification and estimation of damage. Environmental Geology, 52: 205–213. Angeli, M., Heber, R., Menendez, B., David, C., Bigas, J-P., 2010. Influence of temperature and salt concentration on the salt weathering of a sedimentary stone with sodium sulphate. Engineering Geology, 115: pp 193–199. Anon, 1979. Classification of rocks and soils for engineering geological mapping: part 1: Rock and soil materials. Bulletin Association Engineering Geology, 19: 355–371. Bayram, F., 2012. Predicting mechanical strength loss of natural stones after freeze-thaw in cold regions. Cold Regions Science and Technology, 83–84: 98–102. Bell, F.G., 1993. Durability of carbonate rock as building stone with comments on its preservation. Environmental Geology, 21: 187–200. Benavente, D., Garcia del Cura, M.A., Fort, R., Ordonez, S., 1999. Thermodynamic modeling of changes induced by salt pressure crystallization in porous media of stone. Journal of Crystal Growth, 204:168–178. Benavente D, Garcia del Cura MA, Bernabeu A, Ordonez S., 2001. Quantification of salt weathering in porous stones using experimental continuous partial immersion method. Engineering Geology, 59: 313–25. Benavente, D., García del Cura, M.A., Fort, R., Ordóñez, S., 2004. Durability estimation of porous building stones from pore structure and strength. Engineering Geology, 74: 113–127. Benavente, D., Martinez, J., Cueto, N., Cura, M.A, 2007a. Salt weathering in dual-porosity building dolostones. Engineering Geology, 94: 215–226. Benavente, D., Martinez-Martinez, J., Garcia del Cura, M.A., Can averas, M.A., 2007b. The influence of petrophysical properties on the salt weathering of porous building rocks. Environmental Geology, 52: 215–224. Chen, T.C., Yeung, M.R., Mori, N., 2004. Effect of water saturation on deterioration of welded tuff due to freeze-thaw action. Cold Regions Science and Technology, 38: 127–136. Cultrone, G., Luque, A., Sebastián, E., 2012. Petrophysical and durability tests on sedimentary stones to evaluate their quality as building materials. 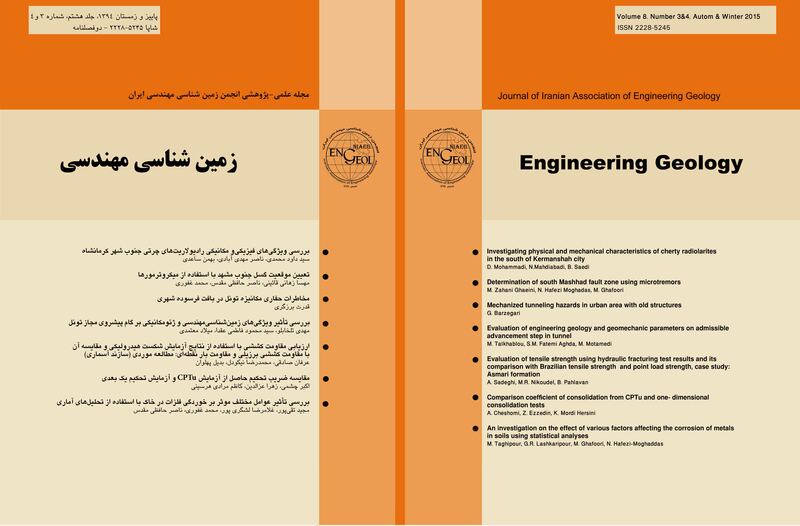 Quarterly Journal of Engineering Geology and Hydrogeology, 45: 415–422. EN 12370, 1999. Natural stone test methods - Determination of resistance to salt crystallization. (FOREIGN STANDARD). Ehrlich, R., Crabtree, S.J., Horkowitz, K.O., Horkowitz, J.P., 1991. Petrography and reservoir physics I, objective classification of reservoir porosity. AAPG Bulletin, 75: 1547–1562. Flatt, R.J., 2002. Salt damage in porous materials: how high supersaturations are generated. Journal of Crystal Growth, 242: 435– 454. Goudie, A.S., 1999a. A comparison of the relative resistance of limestones to frost and salt weathering. Permafrost and Periglacial Processes, 10, 309–316. Goudie, A.S., 1999b. Experimental salt weathering of limestone in relation to rock properties”, Earth Surface Processes and Landforms, 24: 715– 724. Hale, P.A., Shakoor, A., 2003. A laboratory investigation of the effects of cyclic heating and cooling, wetting and drying, and freezing and thawing on the compressive strength of selected sandstones. Environmental and Engineering Geoscience, 9: 117–130. ISRM., 1981. Rock characterization testing and monitoring. ISRM suggested methods. Pergamon Press, Oxford. ISRM., 2007. The complete ISRM suggested methods for rock characterization, testing and monitoring. In: Ulusay R, Hudson J.A (Eds. ), Suggested methods prepared by the commission on testing methods, 1974–2006. Jamshidi, A., Nikudel, M.R., Khamehchiyan, M., 2013. Estimating the durability of building stones against Salt crystallization: considering the physical properties and strength characteristics. Journal of Geopersia, 3(2): 35–48. Kozlowski, R., Magiera, J., Weber, J., Haber, J., 1990. Decay and conservation of Princzow porous limestone, Part 1. Lithology and weathering. Studies in Conservation, 35; 205–221. Nicholson, D., 2001. Pore properties as indicators of breakdown mechanisms in experimentally weathered limestone. Earth Surface Processes and Landforms, 26: 819–838. Nicholson, D.T., Nicholson, F.H., 2000. Physical deterioration of sedimentary rocks subjected to experimental freeze-thaw weathering. Earth Surface Processes and Landforms, 25: 1295–1307. Ordonez, S., Fort, R., Garcı´a del Cura, M.A., 1997. Pore size distribution and the durability of a porous limestone. Quarterly Journal of Engineering Geology, 30: 221– 230. Richardson, B.A., 1991. The durability of porous stones. Stone Industries, 26 (10): 22– 25. Rodriguez-Navarro, C., Doehne, E., 1999. Salt weathering: influence of evaporation rate, supersaturation and crystallization pattern. Earth Surface Processes and Landforms, 24: 191–209. Rodriguez-Navarroa, C., Doehnea, E., Sebastianb, E., 2000. How does sodium sulfate crystallize? Implications for the decay and testing of building materials. Cement and Concrete Research, 30: 1527–1534. Ruiz-Agudo, E., Mees, F., Jacobs, P., Rodriguez-Navarro, C., 2007. The role of saline solution properties on porous limestone salt weathering by magnesium and sodium sulfates. Environmental Geology, 52: 269–281. Scherer, G., 1999. Crystallization in pores”, Cement and Concrete Research, 29: 1347–1358. Schneider, C., Gommeaux, M., Fronteau, G., Oguchi, C.T., Eyssautier, S., Kartheuser, B., 2011. A comparison of the properties and salt weathering susceptibility of natural and reconstituted stones of the Orval Abbey (Belgium). Environmental Earth Sciences, 63: 1447–1461. Sousa, M.O., Suarez del Rio, M., Calleja, L., Argandona, V., Rodriguez, A., 2005. Influence of microfractures and porosity on the physico-mechanical properties and weathering of ornamental granites”, Engineering Geology, 77: 153–168. Topal, T., Doyuran, V., 1997. Enginnering geological properties and durability assessment of the Cappadocian tuff. Engineering Geology, 47:175–187. Tsui, N., Flatt, R., Scherer, G., 2003. Crystallization damage by sodium sulfate. Journal of Cultural Heritage, 4: 109–115. Tuğrul, A., 2004. The effect of weathering on the pore geometry and compressive strenght of selected rock types from Turkey. Engineering Geology, 75: 215–227. Urosevic, M., Pardo, E., Cardell, C., 2010. Rough and polished travertine building stone decay evaluated by a marine aerosol ageing test. Construction and Building Materials, 24: 1438–1448. Valdeon, L., de Freitas, M.H., King, M.S., 1996. Assessment of the quality of building stones using signal processing procedures. Quarterly Journal of Engineering Geology, 29: 299–308. Winkler, E. M., 1994. Stone in Architecture, properties, durability. Thired Edition, Springer-Verlag Berlin Heidelberg. Yavuz, A.B., 2006. Deterioration of the volcanic kerb and pavement stones in a humid environment in the city centre of Izmir, Turkey. Environmental Geology, 51: 211–227. Yu, S., Oguchi, C., 2010. Role of pore size distribution in salt uptake, damage, and predicting salt susceptibility of eight types of Japanese building stones. Engineering Geology, 115: 226–236. Zedef, V., Kocak, K., Doyen, A., Ozsen, H., Kekec, B., 2007. Effect of salt crystallization on stones of historical buildings and monuments, Konya, Central Turkey. Building and Environment, 42: 1453–1457. Zezza, U., 1990. Physical– mechanical properties of quarry and building stones. In: Veniale, F., Zezza, U. (Eds. ), Analytical Methodologies for Investigation of Damage Stones, Pavia, 1 – 20.